I live in Michigan, and I honestly enjoy living here. So every once in a while I get a teensy bit annoyed when I hear people suggest that Michigan’s waterfalls can’t be amazing because there isn’t a significant elevation change. There are some really great waterfalls in Michigan. Just search to find examples! And then, on the opposite extreme, Michiganders (and maybe other vertically challenged states) have a tendency to advertise waterfalls that aren’t really amazing, and probably wouldn’t even register in other states. Whitefish Falls is an example of Michiganders being just a bit too excited, though I’ve seen smaller than this being called a waterfall of importance. 1) There is a stretch of US-41 that runs N/S between Rapid River (which is north of Escanaba) and Marquette. This is found in between M-67 and M-94. 2) If you head north from the intersection of US-41 and M-67, you’ll pass Utah Rd. on your right. 3) Shortly after this, you should see Diffin Rd., followed by River Rd., both of which will be on your left. 5) Park at one of the camp areas, and then head slightly northwest toward the river. It really isn’t that difficult to find. There’s something wildly beautiful about Reany River Falls. I don’t know how to describe it. At the same time, Reany River Falls also seems very calming. It is very easy to access the falls, and also very easy to explore the falls, which allows you to enjoy the falls up close. This is partly because Reany River is not a tall waterfall, so there isn’t a whole lot of elevation change going on here. That doesn’t mean the waterfall isn’t interesting or pretty, though. It’s actually one of the more complex waterfalls I’ve seen. Reany River Falls would be better described as a series of multiple drops that combine to create beautiful scenery. The river is very winding, so it’s essentially impossible to get the whole falls in the picture. A part of the falls is actually under the bridge, effectively hidden from view. Seeing that part of the falls better requires some exploring. 1) From US-41/M-28 in Marquette, you are going to turn at Wright Street near the Target and Taco Bell. 2) Drive a short distance to Forestville Road, and take a left. 3) Continue driving on that road for about 3 miles. You will curve left at one point and end up at a dam/power plant. Right before you reach the parking area, you will have crossed over a bridge. This bridge crosses the Reany River, where the falls are. 4) Park in the parking area and backtrack to the falls. This parking area will also lead you to the series of 4 Dead River Falls. Scott Falls is a small falls. Scott Falls is a fun falls. The waterfall is so easy to get to, as it is right off of M-28. You can pull your car off the road, and you’re essentially twenty feet away, at most. The waterfall is easily missed though, if you’re not paying attention, as it is at an angle to the road. When I visited in May 2009, there was a lot of water at the falls, and I did have to jump over a ditch full of water to get a closer view. I got wet, and the water was not particularly warm, as it was snow melt. In later months, that ditch dries up, and there isn’t as much water on the falls, though it is a perennial falls. You can get extremely close to the falls, and I even think you can walk underneath it. It’s just a really fun falls to visit. 1) As you’re driving along M-28, you’ll end up seeing the falls. 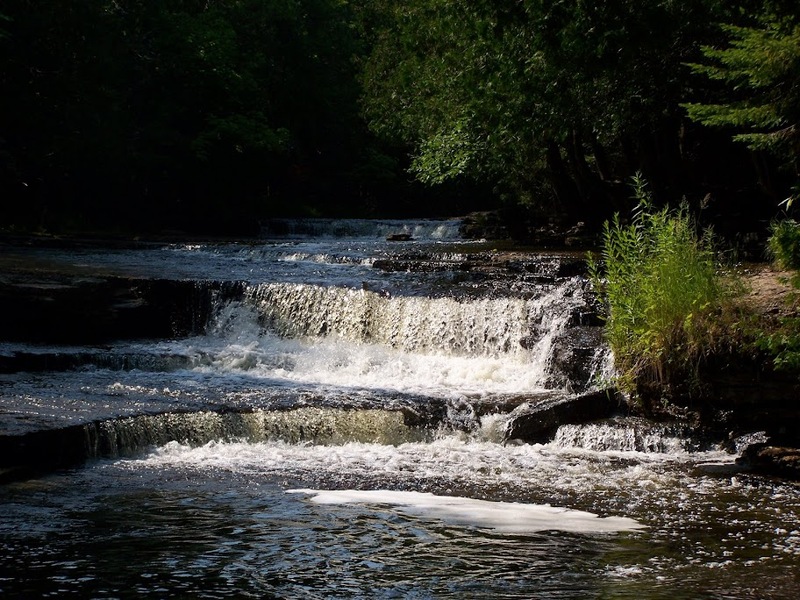 2) If you start in Munising, the falls is about 8 miles outside of the city. You’ll travel west to get to the falls. 3) There is a roadside park right across from the falls, named for H.J. Rathfoot. There is also a sign next to the falls, though as I mentioned it is only visible from one side. Also check out the roadside park, as you are only yards away from Lake Superior.